The Pacific beaches in El Salvador are a surfer’s dream and a common stop for those surfing their way through Central and South America. Even as a spectator, it can be worth a visit. Some of the locals are the top 50 in the world. 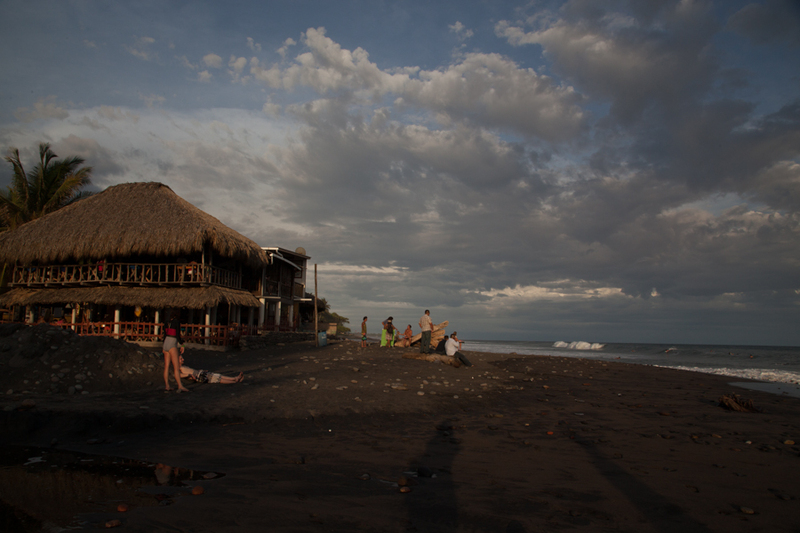 We stayed in Playa El Tunco, but other beaches such as La Libertad and Playa Sunzal are also well known for their surf. Just a warning. El Tunco is not a beginner’s beach. The waves are uneven and break close to the shore. On top of this, if you are not careful a current brings you far out from the beach, making it a challenge to paddle in. El Tunco is also not a swimming beach - while beautiful, it is a mix of black volcanic sand and large rocks that echo a long low rumble, as the waves crash onto shore. Sitting at the hot beach not really being able to swim, wasn't ideal. In the middle of rainy season as well, each night after 7 PM, the sky opened up and it rained for hours. After two days of sweating at the beach I was ready to head inland. After the beach, we headed to the capital, a sprawling city of just over 2 million, with many boroughs mixed in between large strip malls and shopping centres. The centre itself is not particularly attractive nor safe and officially shuts down after 8 PM, although most San Salvadoreans do not visit after 6 PM. Without an accessible centre, locals are highly dependent on vehicles, public transportation and taxis after dark - this makes the capital an urban planner’s nightmare. Devastated by several large earthquakes in the last decades, affected buildings in the centre were rebuilt in the classic ‘modern’ fashion (functional and least expensive appeared to be the requirements). The National Palace (colonial) and Rosario Church (modern) are the two most interesting day-time attractions. 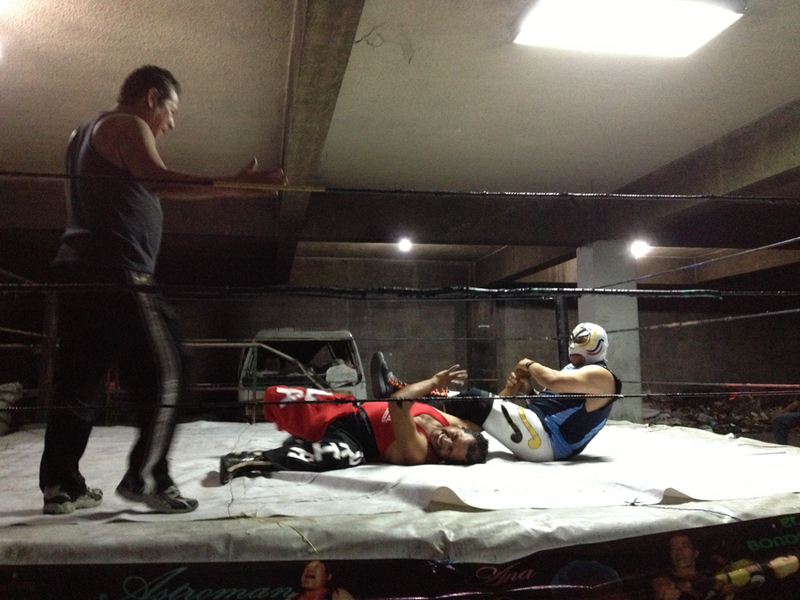 If you are in San Salvador on a Sunday, I highly recommend going to Lucha Libre. A description I read in a magazine and in a local blog made me think it would be an underground ‘fightclub’ type event, so I left my SLR at home. In the end, it was more of a family and friends affair - we were the only tourists, intermixed with local families. There were a handful of teenage girls there, a few children under 10 (they came to watch their mom fight), and we also met Juan Antonio. 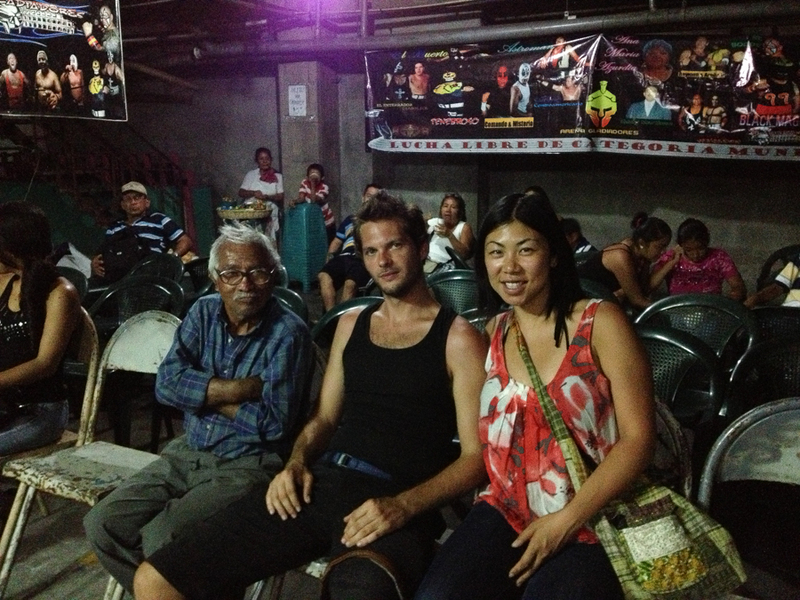 Eighty years old, Juan has been a regular watching Lucha Libre in this parqueo since 1953! He appeared to know all of the fighters well - and several times throughout the night, the luchadors borrowed his walking cane and threatened to use it as a weapon. While no one could describe wrestling as peaceful, the overall atmosphere of the entire 'fight' was light and playful - we had an amazing time! I can't remember who won in the end, 'the good' or 'the bad'. I suppose that after more than thirty years, it doesn't matter anymore. I couldn't stop myself from getting into the ring. Juan Antonio and Gregoire became fast friends! An easy day trip from San Salvador - Parque Boqueron (1800 metres) is located at the top of the San Salvador Volcano. 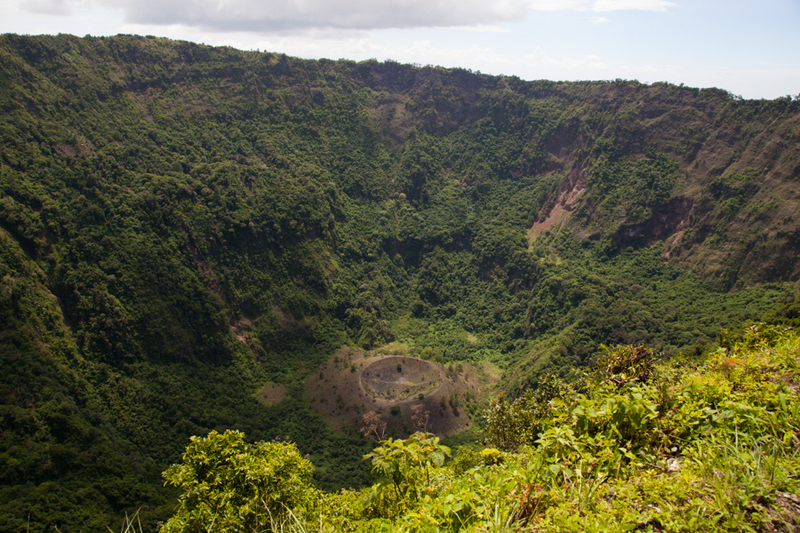 Previously a large lake, the crater was created when the volcano erupted in 1917, draining the lake and leaving behind a 5 kilometre wide and 558 metre deep crater. In addition a small crater Boqueroncito can be seen in the centre. Public transportation takes you one kilometre from the top, and a light hike uphill gives you a great view. Hikes to the bottom can also be done with a guide - approximately one and a half hours down and three to come up. Santa Tecla is a small town just south west of San Salvador. It is a transfer point to get to Parque Boqueron, but on weekend evenings, Paseo del Carmen is a destination on its own. Food vendors sell typical Salvadorean dishes to suit all tastes and appetites. 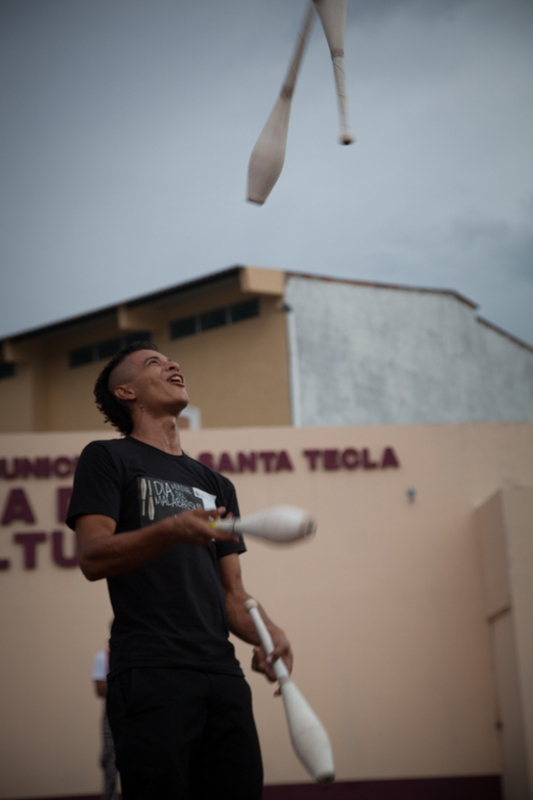 The night we were there, Santa Tecla also hosted an international circus competition organized by El Payaso Simoon and competitors came from all over central america to participate.